The Spro Fat John was designed by B.A.S.S. Elite Series Pro John Crews to be the best shallow running square bill style crankbait on the market. The Spro Fat John comes with two premium Gamakatsu size #3 trebles, and several fish catching colors. 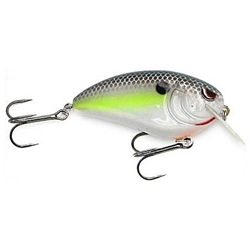 This crankbait also has a soft tungsten weight transfer for extra long casting just like the other baits in the Spro Little John family of lures. The Fat John features a computer chip bill which not only gives the crankbait a unique action, but also lets the angler feel for what the bait is doing on the other end of the line.